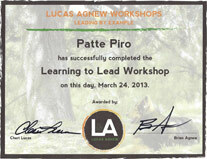 the dog recognizes their owner as the leader, not just a companion..
Patte has spent more than a decade honing her skills in dog training and working personally with well known experts in the field such as Cesar Milan (The Dog Whisperer). In an effort to make your dog a better companion, Patte uses a three pillar approach of human-canine relationships. Proper exercise is a fundamental need. Unwanted behaviors can’t be addressed unless this need is met. Successful dog training relies on a foundation of respect. Your dog will follow you as his leader when he understands there are rules and boundaries, lovingly applied. Affection is important BUT, your dogs devotion to you will grow when they get steady direction. Patte has been charming dogs for over ten years, as a professional dog trainer, masseuse and groomer. …and how she can help with everything from dog walking to agility training. 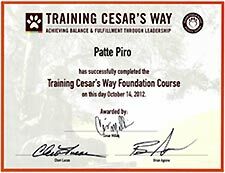 Graduate Cesar Milan's "Training Cesar's Way"
Graduate Lucas/Agnew "Learning to Lead"
Copyright © 2018 Patte Georgeson, all rights reserved.